ON June the 30th, the excursions, which have been maintained since the formation of the Society in 1897, were continued, an expedition having been arranged for this day to the east of the county town. About sixty members attended. A start was made near Trinity Church, Nottingham, at 9.30 a.m. for Gedling, where the rector, the Hon. and Rev. A. E. Bertie, met the party at the church of All Saints, and Mr. Richard Whitbread, M.S.A., of Carlton, who has a thorough knowledge of this fine church, read the following paper. 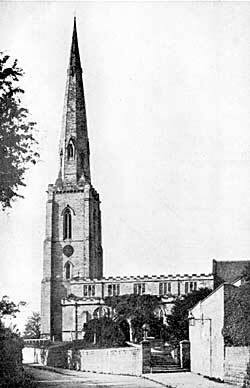 Gedling Church, dedicated to All Hallows, consists of a very fine tower-spire (at the north-west angle), nave, north and south aisles, and an unusually long chancel, its length being twice its breadth. The fabric, with the exception of the porch, is in excellent condition. This is owing to the efforts of the late rector, the Hon. and Rev. Orlando W. Forester, in 1871, and of the present rector, the Hon. and Rev. A. E. Bertie, in 1888-9. The work carried out in 1871 included the removal of a singing gallery and an organ (now in Harby Church) from the west end; the removal of box pews, and a screen (now fixed in the tower archway) from the end of the north aisle; and the lowering of the floor one step below the pier bases. A new roof to an earlier pitch was put on the chancel in substitution for one of the Perpendicular period. The panels formed by the roof timbers are painted azure. The vertical ones at the eaves contain the sun, moon, and planets. The remainder are studded with stars in constellation. The timbers are coloured after an Early English pattern, adopted from Doveridge Church, Derbyshire, by the late rector. The walls were cleared of whitewash and plaster. During the process some Latin texts were found on the wall of the north aisle, and a figure with extended arms—suggestive of the Crucifixion—on the wall under the west window of the nave. The treatment of the walls was very barbarous, not an old tool-mark being left. The piers and arches were more carefully handled. The old tool-marks can be seen on all the piers. They take nearly a vertical course down each stone. On the piers near the pulpit are some well-defined masons' marks; they take the form of the letter N, broad arrows, interlacing triangles, &c.
The nave roof was repaired by Thompson, of Peterboro', under Sir A. Blomfield, in 1888-9. The greater part of the work in this church is Early English, A.D. 1230-1280. The remains of a Norman transitional church, circa 1190, exist in the west end of the nave, the lower part of the north aisle wall, a small window high up near the tower arch, and in the chancel walls from the foundation to the window cills. The east-end wall of the north aisle contains a Perpendicular window, a blocked-up doorway and window of the Early English period, and a small round-headed rood-loft doorway, also blocked up. Some have assigned this doorway to the Early Norman period, and others to the builders of circa 1190. The triplet window in the chancel end, the lancets at the side, and the sedilia and priests' doorway, are Early English, circa 1230. The double-light window in the south wall is Decorated work, circa 1320, and the one in the opposite wall Perpendicular, circa 1400. The three-light windows in the side wall of the north and south aisles are Early English. The former date circa 1250, the latter, and the nave arcades, 1280. The tower and spire and the inserted west window of the nave are Decorated work, say about 1320. The nave roof, clerestory, and porch are early fifteenth century work. The church contains very little carving, but a very pleasing effect is produced by a few carved bosses, and the head of a king and a queen (as terminals of string-courses), some beautifully profiled mouldings and well-proportioned arcading, all being of excellent workmanship. The abaci of the pier and the respond caps are very interesting. They show three stages in the development of Gothic mouldings. Those on the respond, at the west end, circa 1190, have a round and a very flat hollow, whilst those at the opposite end, circa 1230, have a "quick round," and are deeply undercut. In addition to the round and hollow, those of circa 1280 have a V-shaped groove. The members of the two later periods, 1230 and 1280, are assimilated very closely to the form of the earlier one (a very common practice in mediaeval times), and by subtlety in designing have been given a significant character of their own. In the chancel are sedilia, having recesses for priest, deacon, and sub-deacon. They are a good piece of Early English work, and are enriched with the characteristic "dog tooth" ornament and deep hollows and filleted rounds. Under a very crude fenestella is a double piscina, with fluted basins. Near the floor, in the east-end wall, is an aumbrey with triangular-shaped head—similar to the one in the north aisle of Salisbury Cathedral. Another, a few feet above the floor, is in the north wall. A small window, near the chancel arch, belonging to that class of window to which the name of Low Side window has been given, possesses more than ordinary interest. The juxtaposition of a much larger one for admitting light seems to indicate that the admission of light—the object claimed for such windows by some archaeologists—was not the object in this case. The catch, hooks, &c., still remain. Two bays in the north and one in the south aisles seem to have been enclosed circa 1400 (about the time the external chapel and sacristy disappeared), to form chantry chapels. The positions occupied by the top rails are indicated by the rectangular stones inserted in the piers and outer wall. The piscina-fenestella of one enclosure is in the north wall—over the arched recess of a founder's tomb. Thoroton says the window near this spot contained the arms of Bardolf quartering with Beaumont. Whether the old painted glass remaining in these windows is the remains or not of what he saw, cannot be ascertained; but it is old, and ought to be preserved. Of pre-Reformation sepulchral slabs, only three can be found. The oldest lies near the north end of the altar-table. It bears a figure, in low-relief, of a deacon of the twelfth century, clad in alb, dalmatic, stole and maniple; the hands being crossed downwards in an attitude of resignation. He wears short hair and is tonsured. The next slab, in order of date, lies on a sarcophagus near the tower arch; the face of a priest appears through a quatrefoil of a fourteenth century cross-head, and the feet through a trefoil at the bottom of the same cross. The sarcophagus was found in 1872, under the floor at the end of the north aisle and contained several skulls. The third slab, an alabaster one, lies at the south end of the altar-table. A few lines in black wax constitute the remains of an inscription and effigy of a knight of the 15th century. The late Mr. Lawson Lowe, of Chepstow, said in December, 1882, that when he visited the church in 1865, the date could be made out, and he thought the effigy might be that of a knight who fought at the battle of Stoke, near Newark, in 1487. The altar-table is a seventeenth century production in oak. A picture over it is said to be the work of a French artist of the same age. The subject is "The descent from the Cross." The oak pulpit was made in 1880 out of the remains of some stall ends, supplemented by other work done by an amateur carver. The sounding-board of an earlier pulpit was converted into a table, now in the chapter-house at Southwell. The font is a plain octagonal one—probably post-reformation work—standing on an inverted octagonal slab, which formed the base of a former font. The underside of this slab has eight moulded, circular members—Early English in character—prepared to receive cylindrical shafts. This discovery was made a few years ago, when the font was removed from the west to the south doorway. A very good lectern has been made out of one of three seventeenth century brass chandeliers. Attached to one of the piers of the tower arch is part of the head of a cross. It was found buried in the garden of the Chesterfield Arms Inn, about forty years ago. On one side is a crucifix, on the other the Blessed Virgin and Child. (1) Vide Thoroton's History under Stoke Bardolph.